Bilal is terrified of The Test. He can't answer any of the questions! But then Bumble the bee comes along, and he can answer any question you ask, even the really tricky ones. 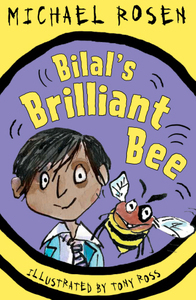 Then Bilal's granny suggests they go on the wildly popular TV quiz show, What's What? Win the Lot! But what will happen if Bilal and Bumble do win the lot...? A wonderfully bonkers and laugh-out loud funny story from dream team Rosen and Ross.